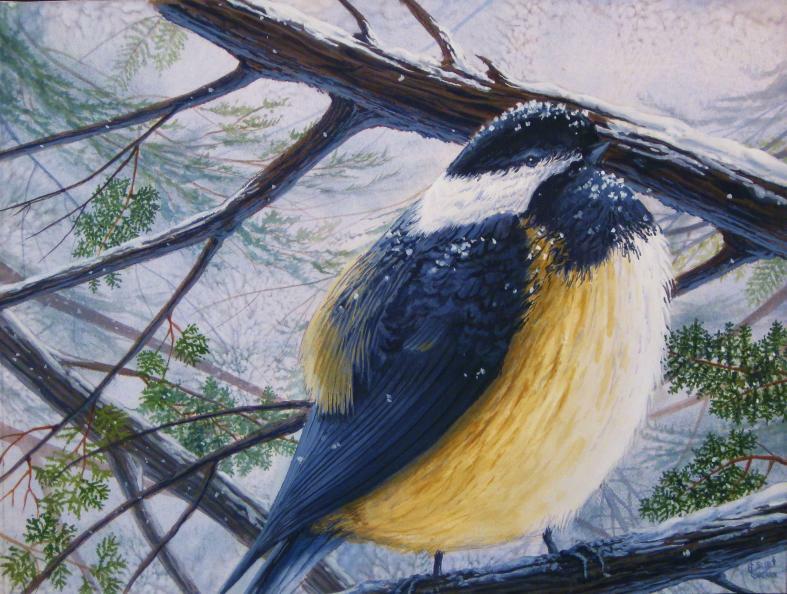 During the winter months, I see black-capped chickadees coming to the birdfeeder in groups of five or six. This chickadee, however, was all by itself. It had quite a routine that went on for at least a half hour, the whole scenario happening during a snowstorm with 30-40 m.p.h. winds. I first noticed the bird seeking refuge from the wind in a red cedar tree just off of our front porch. Normally about one third this size, it had fluffed itself up to insulate from the cold. Sitting there for about two to three minutes while the snow piled on him, it would then shake itself off like a wet dog that always seems comes alongside you. Another flight over to the feeder where it found a single sunflower seed after a short search for the perfect one, then back to its same perch where it put the shell between its feet. Hammering away at the shell with beak allowed access to the interior seed. Then the feathers fluffed up once again and the routine started all over again. The chickadee way. One seed at a time. Amazing patience.